A month after acquiring a full-size Ruger ACP, I went online to shop for a portable pistol safe. There were several things that I put the premium on—I want it to be compact enough to fit under my car seat, and two, it should allow me to quickly access my weapon. Of course, I wanted a safe that is affordable, so I shopped for cheap gun safes. 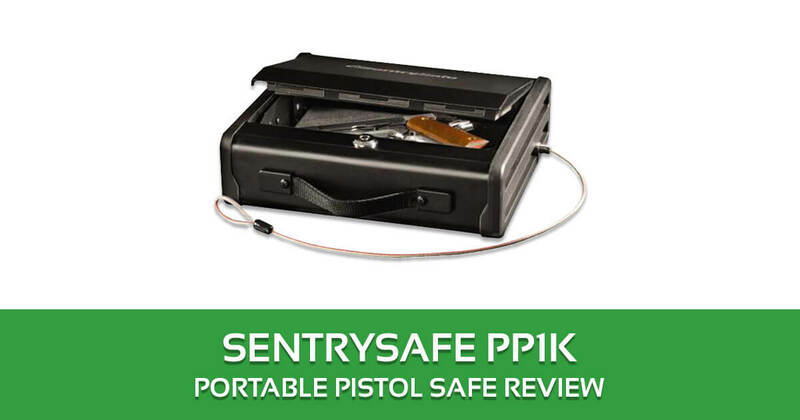 After reading a lot of reviews and comparing features, I bought the SentrySafe PP1K portable pistol safe. I can say this is the best gun safe for people on the go like me. This portable pistol safe is ideal for busy people who are always on the go but would want to protect themselves against an imminent threat. It is also recommended for first-time gun owners who don’t have as many weapons in their collection as the more experienced gun enthusiasts. Budget-conscious gun owners will like it as well. As I mentioned, I wanted a compact pistol safe that I can fit it under a car seat. This gun safe certainly fits the bill, weighing in at 6.5 pounds and measuring 10.1 x 11.3 x 3.4 inches. 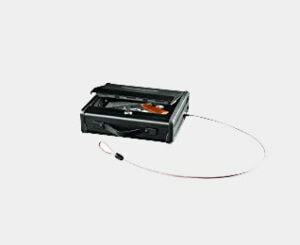 This is one of the lightest safes in its class. Because of its compact design, I can place it in tight spaces in my vehicle. I can even store it in the glove compartment, and there would be enough space inside it for other stuff. I wanted a pistol safe that would let me quickly access my weapon With three options to open the safe- fingerprint, key code or key- there’s a way for you to open this safe fast. Thus when the fingerprint scanner fails to recognize my fingerprint, I can key in the code. If in case I still fail to open it, I can use my key. It even has an extra key so there’s no reason for me not to open this safe. 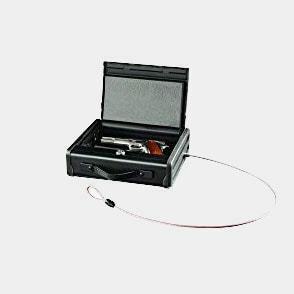 The Portable Safe is made from a solid, 18 gauge steel construction. When it comes to durability and security, I feel that this gun safe is unmatched compared to other similar portable safes. I even compared it to the portable safe of a colleague and I was impressed that the steel of the Sentry Safe is at least twice as thick. It gives me a sense of security as I am confident that burglars won’t easily open this box. Space wasn’t much of a consideration for me because all I wanted was a portable safe where I can store my weapon. So the spacious interiors of the SentrySafe proved to be a bonus for me. The SentrySafe was enough to hold my .45 ACP and two magazines. I think it can even accommodate two more pistols. There’s also foam that blankets the interior of the safe, and provides cushioning for the gun. Lastly, this is a very secure gun safe. The stainless steel safe can’t be easily opened by thieves. It has a 25-inch long steel tethering cable, which I use to anchor the safe to the seat frame. This gives me peace of mind that no burglar will be able to steal this safe in the unlikely event he is able to open my car door. There are also screws and screw holes inside the safe, adding security to this safe. You can’t access those screws until you open the safe, which again adds another layer of security. Can you mount this on a wall? No, this pistol safe is not designed for horizontally. For one, the unit opens from the top so the weapons would fall out if the safe is mounted horizontally. More so there are no pre-drilled holes at the back of the safe. The holes are located at the bottom of the safe. Is there a low battery indicator? The light indicator changes color when the batteries are about to get drained. But this really is not that crucial because you can just open the vehicle gun safe through the key lock if the unit’s battery runs out. The SentrySafe PP1K has been one of the best purchases I have made in recent years. I am glad that I did my research online and compared reviews first before buying a portable pistol safe. This is the ideal car gun safe, in my humble opinion. The compact size of the safe makes it very easy to put this in the trunk or under the car seat which I always do. I recommend it too for motorists shopping for a truck gun safe. And with three ways to open the safe, it is almost impossible for me not to access my pistol quickly. There’s enough space for 2-3 handguns and the price is very reasonable. The safe has its weaknesses like the keypad not being tactile enough but those are really minor issues. I’m very impressed with this safe and I recommend it to anyone shopping for a portable gun safe.